Prince Charles's top financial advisers have been accused of "creative accounting" following an investigation into the royal family's income. The comments came as the National Audit Office was denied access to the Duchy of Cornwall accounts. Labour MP Gerry Steinberg accused advisers of a move to give the Prince access to money he is not supposed to be able to touch. Bertie Ross, secretary of the Duchy of Cornwall, denied the allegations. Sir John Bourn, head of the NAO spending watchdog, asked to examine the Duchy's finances and report on his findings to Parliament. 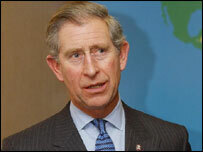 Bertie Ross, secretary of the Duchy of Cornwall, turned down the request, saying the Prince's income was private. Mr Steinberg claimed the advisers had moved capital, to which the Prince cannot get access, into the revenue accounts so he could use the funds. Mr Ross and head of finance Keith Willis denied the allegations, saying this had not happened. Mr Steinberg also questioned the aides about a sum of £1.2 million, which he claims was borrowed from the capital accounts. He said: "This looks very much like jiggery-pokery. "It looks like you've been doing a bit of fiddling." The accusations came during an interrogation by MPs of the two institutions responsible for generating private income for the Queen and Prince of Wales. Aides from the Duchy of Lancaster and Duchy of Cornwall went before the Commons Public Accounts Committee. It is the first time the Commons Public Accounts Committee has been able to scrutinise the Duchy of Cornwall and Duchy of Lancaster's accounts. Edward Leigh, Chairman of the Public Accounts Committee, described the meeting as an historic occasion. Duchy officials, who appeared before the committee on Monday afternoon, are only responsible for generating money. The Duchy of Lancaster provides the Queen's private income, while the Duchy of Cornwall provides Prince Charles's annual cash flow. The Duchy of Cornwall is a 140,000-acre estate across 25 counties, and also includes residential properties, shops, offices, stocks and shares. It was set up in 1337 by King Edward III to provide income for successive heirs to the throne. It covers the cost of the prince's public and private life - neither Charles, nor his sons Princes William and Harry, receive taxpayers' money from the Civil List. However, the Prince of Wales did receive over £4m from government departments and grants-in-aid in 2003-4. The duchy last year generated almost £12m. The prince has voluntarily paid income tax - currently 40% - since 1993. Labour MP Alan Williams said Prince Charles's accommodation at Clarence House, with the use of Windsor Castle, was the "best housing benefit scheme in the world". He said Charles had been paid a total of £85 million - an annual average of £6 million for 14 years. This includes a 300% pay rise over the past decade. "To the public that would be like winning the National Lottery every year," he said. He added Prince Charles' income was equivalent to the combined salaries of 450 of his constituents. Mr Williams asked the Duchy's secretary and keeper of records, Bertie Ross if he thought the Prince's income was a bit excessive. Mr Ross said it was his job to provide the income from the estates, and it was not relevant for him to comment on the sums of money generated by these. My quest: How rich are the Royals?